Manufacturer of a wide range of products which include centrifugal pump test rig, vane apparatus, flow over notches, mouthpiece apparatus and orifice meter apparatus. 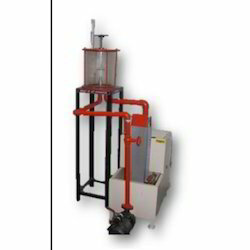 Centrifugal Pump Test Rigs offered by us consist of a centrifugal pump, coupled with electrical motor, supply tank, measuring tank & pipe fittings for closed loop water circulation. Pressure and Vacuum gauges are connected on delivery and suction side of pump for the purpose of measurement. The flow rate of water is measured using measuring tank and stop watch provided in our Centrifugal Pump Test Rigs. To plot Head vs. Discharge, Pump efficiency vs. Discharge. MS Tanks with FRP Lining. Pump : 1HP Centrifugal Pump. Supply Tank : 80 Ltrs. Made of MS with FRP Lining. Measuring tank : 40 Ltrs. Made of MS with FRP Lining and fitted with piezometer tube & scale. Control panel : 1HP Thyristor Drive with Digital RPM Indicator. Electroics Energy Meter. Digital Timer. MCB Load and Line Indicator.Fitted with Pressure Gauge and Vaccum Gauge. 5A,Three pin socket with switch for pump. Ours is an illustrious organization that is engaged in manufacturing and supplying qualitative Vane Apparatus. 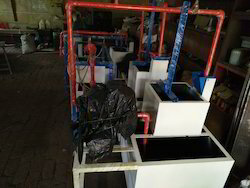 These products consist of visible test enclosure, supply tank, measuring tank and pump for closed loop water circulation. Offered range is used to study the force developed by impact of jet on different surfaces. Our company specializes in manufacturing and supplying quality approved Flow Over Notches. All these equipment consists of a flow channel section, supply tank, measuring tank and pump for closed loop water circulation. 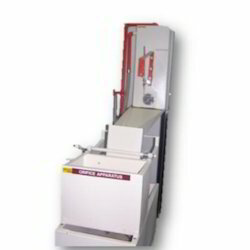 Our range is used to determine co¬efficient of discharge using different notches. Backed by rich industry experience, we are manufacturing and supplying optimum quality Mouthpiece Apparatus. Our range is designed to study the discharge through different orifice and mouthpiece. These products consist of an adjustable head constant level tank, supply tank, measuring tank and pump for closed loop water circulation. 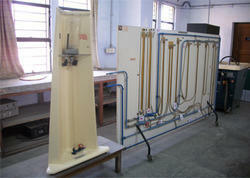 Looking for Fluid Mechanics Laboratory Equipment ?